I’m a bit out of kilter this week having been away for a long weekend so no ‘small stone’ today. Last week, in my report on the Tissington Trail ride I mentioned the charity Sustrans, well earlier this year we bought a copy of a book produced by Sustrans called ‘Traffic-Free Cycle Rides, 150 Great Days Out’ and having done a couple of the trails at the York Rally and also when we did the Eroica Britannia we decided, especially now we have the mixte bikes, that it would be fun to do some of the others listed in the book. Lake viewed through the trees. So on Friday we took ourselves in our Motorhome off to Rutland Water. Rutland is the smallest county in the UK for those of you who have not heard of it and Rutland Water is a large reservoir built in the 1970’s to supply the water needs of the East Midlands, with water pumped into it from the river system. It is beautifully landscaped and is largely a nature conservation area. As well as water activities such as sailing and wind-surfing there is also a ‘beach’ with swimming area and a water park, and includes the Sustrans route that we had set out to ride. 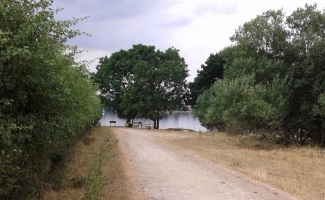 This is nicknamed ‘La Tour de Rutland’ and is a cycling and walking trail around the lake, mostly along the shoreline but with some short quiet road sections, of approximately 15.5 miles. There is also a peninsula into the lake with its own loop of an additional 7 or so miles round, so of course we did the whole lot. 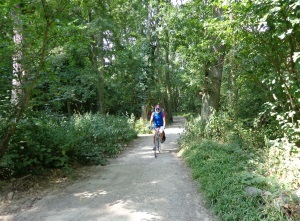 We did a short ride on our arrival on Friday afternoon to check how far it was from the campsite to the trail. This turned out to be no more than about half a mile downhill (we could see the lake from the campsite) so we continued for a short distance along the trail to get a feel for it – about 4-5 miles there and back. On Saturday morning we set off to do the whole ride. It was an overcast but warm day with the sun breaking through from time to time. However it was bearable – apart from the midges for the first few miles! We were in no rush, simply there to enjoy the ride and the scenery and we had plenty to drink and to nibble along the way. We stopped frequently to enjoy the views, take photos or to eat and drink and in all it took us about 4 hours to do the 23 miles – no prizes there, but that wasn’t the point of the exercise. We returned to the Motorhome in time for a late lunch. One of the most interesting parts of the ride was the wonderful views of Normanton Church (known as the Lady of the Lake). The church originates from Mediaeval times though it was partly rebuilt during the 18th and 19th centuries. No longer needed, the church was de-consecrated and due to be demolished but public outcry demanded it be saved when the reservoir was constructed. It was then decided to turn the land around it into a small island with a causeway to the shore and the lower part was filled with rubble topped with concrete just below the level of the windows. It is now used as a venue for civil weddings, other events and concerts. 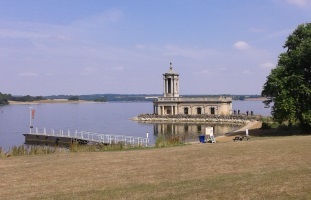 I have long wanted to visit Rutland Water and this cycle ride was a wonderful way to see it. The trail itself was much rougher than the Tissington Trail had been, with more loose gravel sections and it was also quite undulating with some steep climbs and descents. It made for a quite challenging ride, especially in the warm weather and we were glad of a relaxing afternoon. While we were in the area we decided to move on the next day, further south to do it all again around Grafham Water, but that’s another story….. Thanks for bringing us along. The church reminded me of one along the shores of one of Berlin’s many lakes. Yes, it is lovely and iconic in the area. I haven’t been to Berlin so sadly can’t compare but a lake side location does set off an attractive building so well. Lovely. I believe the RSPB are present around Rutland water on account of the birds. Yes indeed, there are many locations for bird watching, hides provided. I enjoy your adventures. I had a lake to go round – but I walked it when I visited another state. The trail was built by a Scout. But it wasn’t maintained – well at least not when it was cold – maybe they’ll have had a clean up crew when the weather warmed up. Sustrans have teams of volunteers who help keep the trails maintained which is wonderful.